We bring you today's FitDog Friday from both neighborhoods we play in -- the one with our real backyard and the one in the blogisphere. There's been so much going on this week, we wanted to share a few nuggets from both! First, Rocco's been running his own FitDog bootcamp in his own backyard. He's got two little pals visiting and he's seeing to it that they get LOTS of exercise! Playtime stops while they are still having fun, so they don't get overtired and cranky and they don't overdo it AND they want to play more later! Next, backyard bootcamp comes just in time for K9 Kamp. 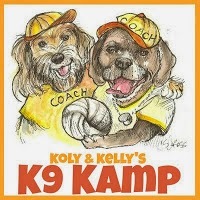 It's that time of year again so check out lots of fun activities from the K9 Kamp co-hosts Kol's Notes, Peggy's Pet Place and You Did What With Your Wiener! You can see Rocco and his Kampers Codie and Bingo playing in the photo collage above! And he's got some indoor activities planned too. Even when the weather is bad or the sun goes down, there's always time for a rousing game of fetch down our long hallway. And if that's not enough, this Wednesday was National Pet Obesity Awareness Day. We saw some cool tips on a few of our pals' blogs. Kol's Notes shared this nifty guide to help you check if your pet is overweight. I immediately ran over and did the check on Rocco. In fact, I feel for his ribs pretty often since it's hard to tell what's going on under all his fur! We found this link to a pet weight translator on Peggy's Pet Place. Pretty shocking when you realize what just an extra pound or two translates too on a small pet. Slimdoggy created this cool pet obesity infographic. Not only may you be overfeeding and wasting calories, but check out how much money you may be wasting too! And finally, we registered on PetsMove.org, the community that our pal Slimdoggy helped create to inspire people and pets get fit and healthy together. Check it out! There's lot fun stuff and cool people and dogs there! 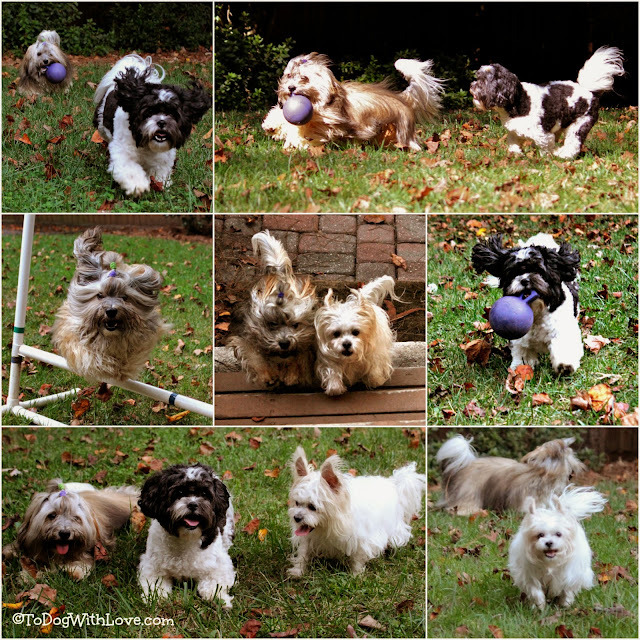 The fun and games continue every Friday with FitDog Friday, the weekly Blog Hop brought to you by To Dog With Love, SlimDoggy and Peggy's Pet Place to promote a healthy active lifestyle for pets (and their people, too!) and to help combat pet obesity. Join in every Friday by linking up your FitDog story or visiting the blogs in the Hop. We have some good fun romps with friends in our backyard and in theirs. Great tips since it is hard to keep enough water around and once someone (I'm not naming names...) gets tired, it isn't as playful any more! I figure it's a lot like training... stop while they are doing great and before they are too worn out! Keep the pups wanting more! Thanks pal! Evenly matched by size/weight is a good tip too though big and small dogs can co-exist nicely together. You just have to watch that play doesn't get too rowdy. Look at Rocco with his own bootcamp! I'm shipping Mr. N over to your bootcamp. He needs some size appropriate playmates. Looks like fun! heehee! Mr. N would fit in perfectly! It sure is nice to have same-sized doggie playmates! Having friends over is always so much fun, but I bet it is even more fun if you are an only dog. Looks like they will all need a bit of rest when the fun ends! What fun! You all are so cute playing together.